The ‘Passeig Sant Joan’ is a promenade which connects the district of Gràcia with the Ciutadella Park. Part of it was redeveloped into one of the first Green Corridors in Barcelona, aiming at increasing ecological and social connectivity within the city. The total length of the renovated part is 1.2 km and it was completed in 2015. This section corresponds to the Eixample district and follows a boulevard design that prioritizes vehicular use and commercial activities. This design distributes the use of the space between: wide sidewalks, two car lanes, and a segregated bidirectional lane for bicycles. Until then, this part of the promenade had been particulalry neglected in terms of public space infrastructure, despite it being a key location, close to touristic attractions, very well connected and not far from the old city center. Eixample is one the districts with the lowest availability of green space per inhabitant. 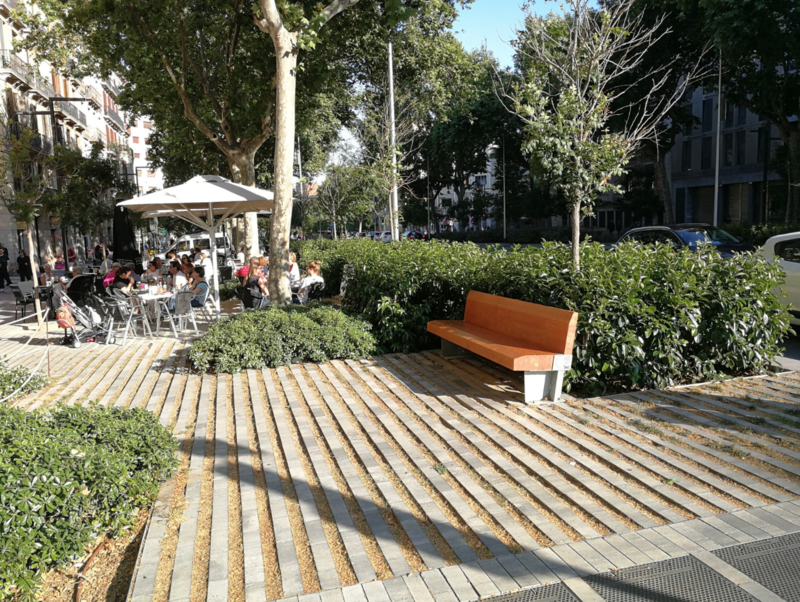 To improve public space functionality and use, to increase access to green spaces for district residents (Eixample), to contribute to higher biodiversity in the city, and to promote more and different retail activity at the ground floor of buildings, so to rejuvenate/boost the local economy. Urban regeneration was enabled through the introduction of green infrastructure that: 1) is more welcoming, provides high quality cultural and regulating ecosystem services —thus increases direct use values, attracts more people and more local businesses, 2) through its design favors ground floor service-based retailers (bars and restaurants), which are attractive both to locals and tourists. New green space and amenities promote children’s play, relaxation, improved micro-cimate (shading) and less car circulation (pacification, better air quality), hence improving the quality of life in the area. Carbon sequestration is increased via an enlarged area for street trees and other vegetation comparing to traditional sideways in the city. The semi-permeable pavement and irrigation system installed in most part of Passeig Sant Joan allows for water collection and mitigates run-off while also promoting sustainable water use. This model of green enhanced and enlarged sidewalk with amenities that invite multiple uses etc. can be applied in any urban context given: 1) automobile circulation can be diminished 2) space exists for amplifying sidewalks 3) weather conditions allow for the integrated use of economic activities (bar terraces) 4) city councils can provide the budgetary requirements 5) mobility, urbanization and ecology departments can collaborate at local government level. ENABLE is a European-wide BiodivERsA project with case studies in different European cities. Re-prioritising more integrated NBS thinking within local institutions is as necessary as cultivating higher levels of socio-environmental awareness. Ecosystem services provided by NBS contributing to health, leisure, aesthetics or economic aspects, can be in conflict with ecological/sustainability priorities. Early civil participation is key for civil engagement in NBS. Barcelona City Council (2010). The urban green corridors Examples and criteria of design (Original title: Els corredors verds urbans Exemples i criteris de disseny) (Guies d’educació ambiental No. 38). Barcelona, España: Ajuntament de Barcelona. BCNecologia - Agència d’Ecologia Urbana de Barcelona (2006). Pla estratègic d’espais lliures de Barcelona. Els corredors verds urbans. Barcelona.